Art sparks our community! 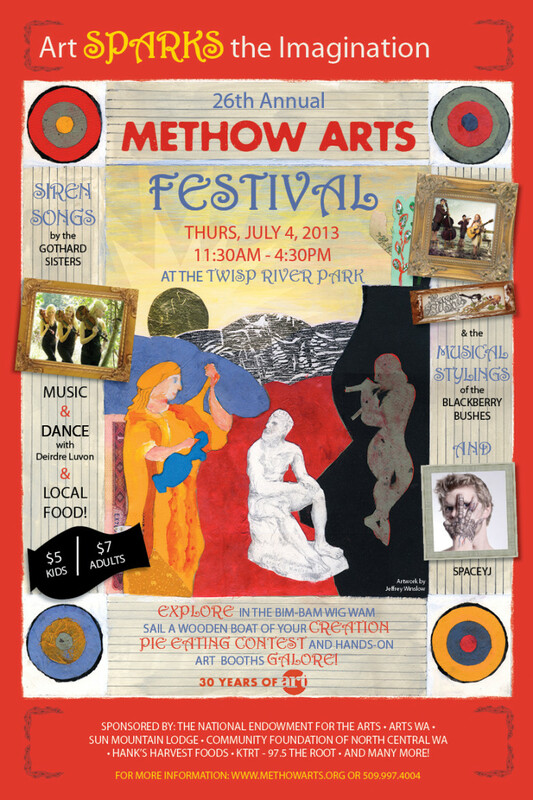 Discover that for yourself at the 26th annual Methow Arts Fest on the 4th of July from 11:30am-4:30pm. This year’s festival—themed “ART sparks the Imagination”—celebrates the role that art plays in inspiring our community through many generations – 30 Years of ART at Methow Arts Alliance. Held in the Twisp River Park starting just after the Independence Day Parade through Twisp, the festival offers something for everyone. The core activities are about a dozen art booths offering a variety of arts experiences for all ages. Led by teaching artists and community volunteers, the art booths include annual favorites such as Laverty Construction’s Wooden Boats, and face-painting and tattoos, as well as new booths like the Bim Bam Wig Wam Community Art Sculpture, painted lanterns, brilliant botanical prints, leather cuff bracelets, sand mandalas, magical scrolls and book arts. Spark-themed costumes of flaming headdresses and torches will be available for those who want to dress the part. This year’s artwork featured on our poster is by local artist Jeffrey Winslow. Musical Stylings by the Blackberry Bushes Stringband. Demonstration booths will feature painters, glass artists, massage therapists, and irresistible baby goats. And the increasingly popular pie-eating contest will move to center stage so the rest of us can watch the hilarious battle of mouth, stomach, and will. The whole park becomes a stage during the festival: dancers moving in a blur of color; local food, an dessert wagon and live music keeps the scene dynamic, as well as providing a vibrant backdrop for the many celebrations of art happening around the entire park. Delicious local foods, drinks, and treats will be available for purchase during the festival. Tall pines and event tents provide shade in the park, but if you’re tempted to take a dip the Wagner Memorial Pool and the Twisp River are right across the street, providing cooling-off opportunities throughout the day. Admission is only $5 for kids 6 and up (which includes 5 free booth tickets for kids) and $7 for adults, thanks to the generous support of local business sponsors and more than 100 volunteers. Free tickets are available to clients of the Cove Food Bank, Room One, and the Methow Valley Senior Center at those locations. CONTACT: Methow Arts for information and volunteer opportunities, 509.997.4004, info@methowartsalliance.org. $5 kids/$7 adults. FACEBOOK and TWITTER. TICKETS: Advance tickets and reduced fee family passes @ BrownPaperTickets.com, Twisp Daily Business, Riverside Printing. VOLUNTEERS WANTED! And receive FREE T-SHIRTS AND LOTS OF TLC!